Last week, there was a sharp fall in Matrix Concepts Holding Berhad's share price from the highest of RM3.93 to the lowest of RM3.31 in just a matter of few trading days. I look back its latest result to check whether I missed out anything. The group still have around RM593 mil unbilled sales and the ongoing GDV able to keep the group busy for the next 2 years too. The take up rate is averagely 63.1% at which the major township, BSS having a take up rate of 78.4%. For the 9-months FY13, the group recorded a revenue of RM430.3mil and a bottom line of RM112 mils and a good gross profit margin and net margin of 44% and 26.1% respectively. There is still one more quarter to go before the end the financial year, but it already surpass its previous year result in terms of net profit thanks to the better margin for industrial property and sales of land. EPS may reach 50 cents for the full year of 2013. Thus, its PE will be in the region of 7.0 at the price of RM3.50 with a total of 25.4 cents dividends already declared up to date. 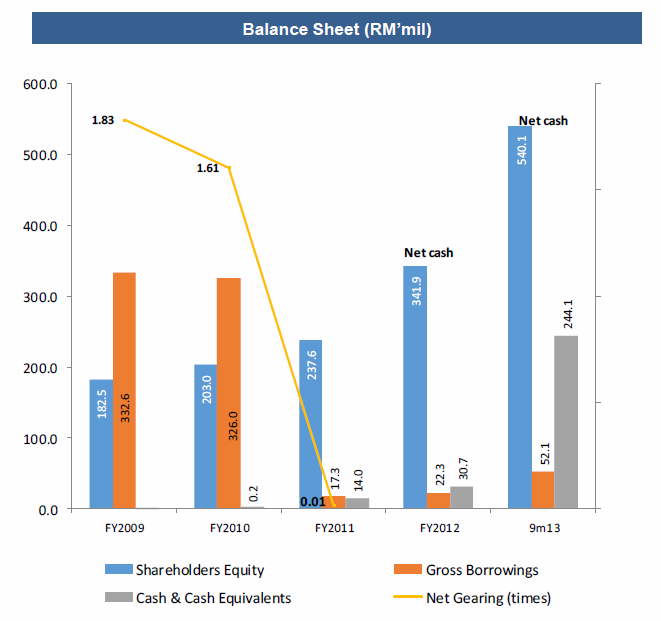 The group is at a net cash position too with a cash balance of RM244 mil, giving it a strong position to enlarge its land bank in the future. Before this, the group purchased a land in Labu for RM47.5 mil which was internally funded. The group also purchased a land in Rasah Kemayan for RM59.3 mils which was 40% internally funded while the rest through borrowings. Both lands are situated at nearby of BSS with a total GDV of RM1.5 bil commence in 2015. In addition, the group also purchased a land in KL near PWTC for RM43.6 mil ( 40% internal funds, 60% bank borrowings) to build mixed development of high-rise apartments. After all these land purchasing, the group left around Rm155 mil cash in hands. (244 - 47.5 - 23.72 - 17.44) but gearing will be up a bit. 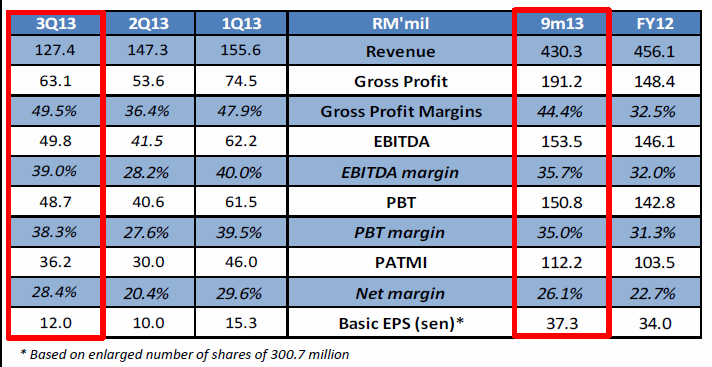 Based on the 3rd quarter result, its has an operating cash flow of RM120 mil too for the 9 months period. Thus, the group still has the ability to pay dividend quarterly next financial year due to its strong cash flow. 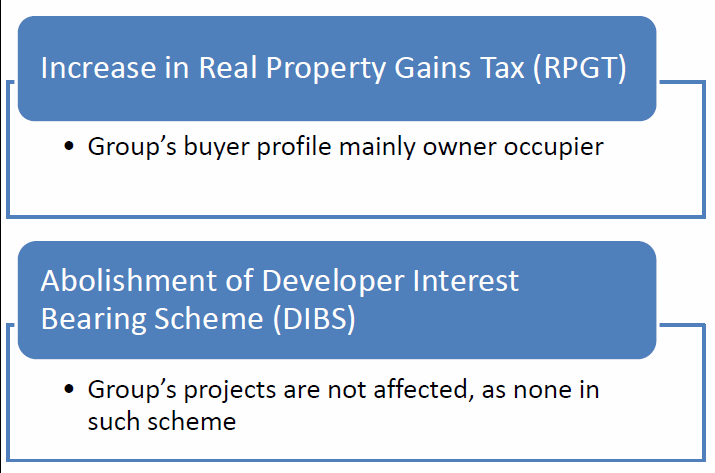 Furthermore, the group insisted that the group's buyers are mainly owner occupier and they did not use DIBS scheme too. Thus, the group is not much affected by the cooling measures announced in Budget 2014. So, its fundamental remained intact. A sudden drop of price gives an opportunity for the buyers to purchase more. Conservatively assume the dividend for the next financial year is around 20 cents, the DY will be above 5%. But bear in mind that the CEO, Dato Lee Tian Hock disposed certain amount of his shares in Matrix at the price of RM3.18 - RM3.25 in open market at early Dec. So just keep monitoring.